Punisher #10 - Spidey was funny, but this was missing some of the energy from the Marvel Team-Up issue. Also, it finally hit me... the good guys plan is to destroy the hard drive? Waitbutwhy? Give it to SHIELD! New Mutants #41 - We're back to the previous artist and i don't love him. He's generally ok, especially for a casual fun downtime issue like this, but when people smile it's like they've been possessed by the devil. I do like his Warlock, though, and there were fun scenes with him and in general. X-Factor #234 - I can definitively say i wouldn't be getting this book if i wasn't contractually obligated. It's not bad... it's just kind of blah. Avengers vs. X-Men #2 - This is pure fanboy fun and i'm loving it. Red Hulk vs Colossonaut. Magik zapping Dr. Strange to Limbo, where's she's the sorceress supreme. Iron Man taking out Emma Frost and resisting Magneto's powers. Captain America repeatedly love-tapping Cyclops and essentially saying "Please don't make me hurt you for real." I mean, there's no plot, so i don't know how the rest of this series will go, but i had fun. Avengers #25 - I want to start by making it clear right now that i'll never be trying to sync up the fight scenes depicted in this issue with the main AvX series. Here we have Colossus decking Iron Man (which would be a cool fight) and Captain America decking Magneto (seems unlikely), and more, and while i'm sure there's a way to make those moments scene fit into the main story, i'm not going to try. Let's get my complaints out of the way as well: we know that Hawkeye and Spider-Woman are dating; they don't need to start making out now every time they're on the same page for two panels. And is that actually Spider-Woman? It's a weird look for her. I also don't love this idea that AIM's love of science somehow makes it a quasi-religion. It should be quite the opposite, in fact, and having their new leader meditating in a rose garden doesn't work for me. If you're going to use AIM, play up the science angle. Plenty of other groups out there if you want a religious cult. All that said, Avengers vs. AIM is fun, the Iron Man/"Protector" dynamic is done well enough, and Kree angle on the Phoenix arrival could be interesting. Thunderbolts #173 - So the "meeting the original team" plot is a great way to show how some characters have grown - especially Fixer - in addition to setting up some nice fights. I have some geeky half-baked concerns about the "raid Dr. Doom's castle" scheme; i'm fairly certain i remember reading a post-Onslaught X-Force comic where SHIELD secured the castle to prevent exactly something like this from happening, but of course it's an alternate timeline plus maybe that just hasn't happened yet and/or we'll see where it actually goes next issue. And whatever happens when this book becomes Dark Avengers, i hope we can have a break-out Mr. Hyde and Troll series. NM: ugh. the art was scary. the characters were annoying. i feel the opposite of fnord12. even my love of warlock couldn't save this issue. i even found warlock to be annoying. and for god's sake, get some goddamn shoes!! you realized during the last storyline that being barefoot was a bad idea. wtf, man? XF: ok story. more enjoyable characterization than NM, imo. Avengers: Walt Simonson art - sadly, it was not very good. close up shots of faces were fine, but anything remotely distant or in the background went down in quality quickly. the storytelling was bad, too. transitions from one scene to another weren't done very well. instead of one coherent story, i felt like i was being jumped from one thing to another. and yeah, Spider-Woman. oy. 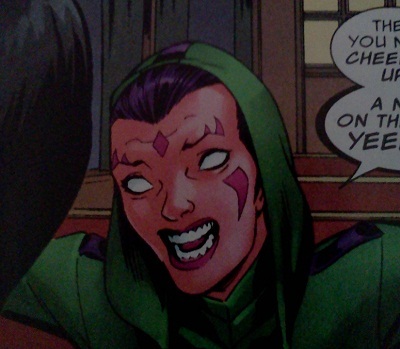 either Bendis is getting worse or Wanyas' constant complaints are starting to affect me. he cannot stay in a voice. Thor is done terribly. it's like Bendis overcompensates for slipping into modern vernacular by being way too archaic and stilted. in one scene in particular, he goes from saying "as they say" like it's a phrase he's heard but doesn't use himself because it's too modern to saying in the very next sentence "buck the system". the bad dialogue with the mediocre art made this book less than enjoyable.